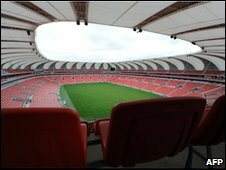 The row comes as a South African judge refused to stop a separate traditional Zulu bull-killing ceremony from going ahead on Saturday, instead calling on parliament to look at the issue. The National Council for the Prevention of Cruelty to Animals (NSPCA) has written to Fifa over the World Cup issue. The issue of cattle sacrifice was also discussed by a High Court on Tuesday, when Judge Nic Van der Reyden said the matter needed to be taken up by politicians. Activists from Animal Rights Africa brought a legal challenge in an attempt to stop a traditional Zulu bull-killing ritual from going ahead at a harvest festival on Saturday. 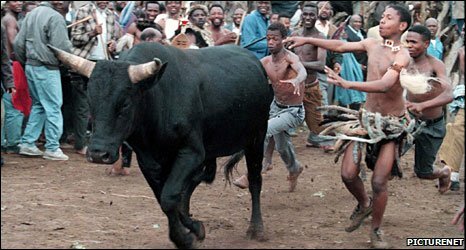 Known as Ukweshwama, it involves a crowd of young men killing a bull with their hands, and is considered to be a rite of passage to manhood. The judge in Pietermaritzburg said the activity was as important to the Zulu tradition as the Holy Communion was to Catholics, South Africa's Sapa news agency reported. "I suggest that all parties sit down and agree whether video footage can be taken during the ritual so that this matter can be handled by parliament," he said. The activists said they had tried to lobby the Zulu king and the government, whose leader President Jacob Zuma is a Zulu, but had had no response. However members of the Zulu royal family were believed to be at the court hearing. The parties are due to return to court on Friday.